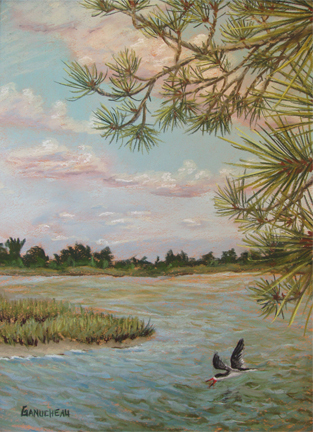 Original Art; Pastel pleine-aire painting of the view from the Duke Marine Center on Pivers Island, NC by Rose Ganucheau. Painted at the Duke marine Lab in early summer 2007. I found these short leaved, gnarled pines where I set my easel under their dappled shade looking back toward the road to Beaufort, NC. It was beachy-breezy, and I had to hold onto my gear as I painted. I couldn't keep the hat on my head, and ended up with a sunburn. The sky and water were a hundred shades of blue as the light ricocheted off the constantly moving landscape.